To evaluate comparative outcomes of laparoscopic transcystic (TC) and transductal (TD) common bile duct (CBD) exploration. We systematically searched MEDLINE, EMBASE, CINAHL, CENTRAL, the World Health Organization International Clinical Trials Registry, ClinicalTrials.gov, ISRCTN Register, and bibliographic reference lists. CBD clearance rate, perioperative complications, and biliary complications were defined as the primary outcome parameters. 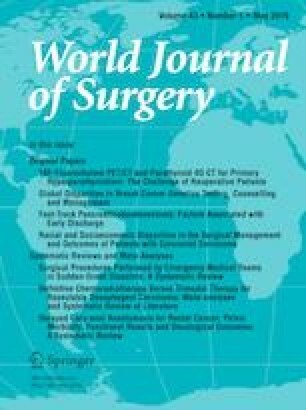 Procedure time, length of hospital stay, conversion to open procedure were the secondary outcomes. Combined overall effect sizes were calculated using random-effects models. We identified 30 studies reporting a total of 4073 patients comparing outcomes of laparoscopic TC (n = 2176) and TD (N = 1897) CBD exploration. The TC approach was associated with significantly lower overall complications (RD: −0.07, P = 0.001), biliary complications (RD: −0.05, P = 0.0003), and blood loss (MD: −16.20, P = 0.02) compared to TD approach. Moreover, the TC approach significantly reduced the length of hospital stay (MD: −2.62, P < 0.00001) and procedure time (MD: −12.73, P = 0.005). However, there was no significant difference in rate of CBD clearance (RD: 0.00, P = 0.77) and conversion to open procedure (RD: 0.00, P = 0.86) between two groups. Laparoscopic TC CBD exploration is safe and reduces overall morbidity and biliary complications compared to the TD approach. Moreover, it is associated with significantly shorter length of hospital stay and procedure time. High-quality randomised trials may provide stronger evidence with respect to impact of the cystic duct/CBD diameter, number or size of CBD stones, or cystic duct anatomy on the comparative outcomes of TC and TD approaches. Shahin Hajibandeh and Shahab Hajibandeh equally contributed to this paper and joined first authorship is proposed. Shahin H, YK, SK contributed to design and conception. Shahin H and Shahab H contributed to the literature search and study selection, data collection, analysis and interpretation, and writing of the article. All authors critically revised the article and provided final approval. There are no funding sources for this work and no conflicts of interest and financial disclosures for the authors.